Create a magical escape in your garden with our awesome Solar Windy Wavers - Flower Garden Stake. You'll love that the clear flower design adds a subtle touch of character to your garden during the day. But the real show begins at night when the solar-powered LED light makes your solar flower garden stake shine! After charging its solar panel during the day, our flower solar lights are then brightened by a color-changing light that shifts from multiple colors! Light smoothly changes into an array different colors providing an after-dark light show. Solar Flower, 2" x 2" x 42". Durable plastic flower, metal garden stake. Great for lighting a garden or walkway, adds fun to any outdoor setting! Each has an auto-sensor that activates the LED light automatically at dusk. 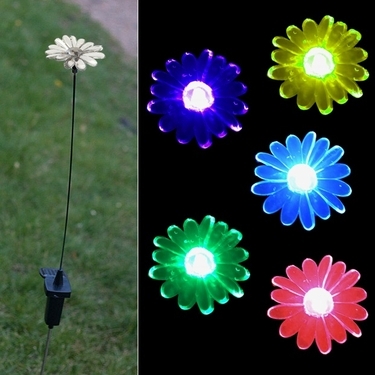 Makes a delightful solar flower light garden gift!